K-cup coffee makers have increased their popularity lately. You will encounter them in almost every home and office. This popularity can be attributed to their versatility and convenience. The single cup coffee makers are an intelligent alternative for the automatic coffee makers. The real deal is that there are some of these machines that are quite affordable going for less than $50. These coffee makers use K cups for brewing like Keurig coffee makers. The biggest difference between these cheapest k cup coffee makers and Keurig is brand and price. We can not say that these coffee machines are better than Keurig’s but they do what they need to do and that makes them good and cheaper Keurig’s alternative. With the variety of K-cups available ranging from coffee, tea, and hot chocolate among others, users are spoilt for choice when it comes to flavors. These K-cup brewer tend to save you a lot of hassle for heading to the cafeteria daily. Additionally, they are a perfect choice to entertain guests at home as all you need is buy a variety of K-cups. If you purchase a reusable filter you not need to use just K-cups you can use also and your favorite ground coffee. Below you can look on our reviews for five good and quality cheap K-cup coffee maker under $50 that you should consider to buy. The Aicok single serve is one of the most reliable and affordable k-cup coffee makers in the market. It’s is small in size making it excellent for travel. 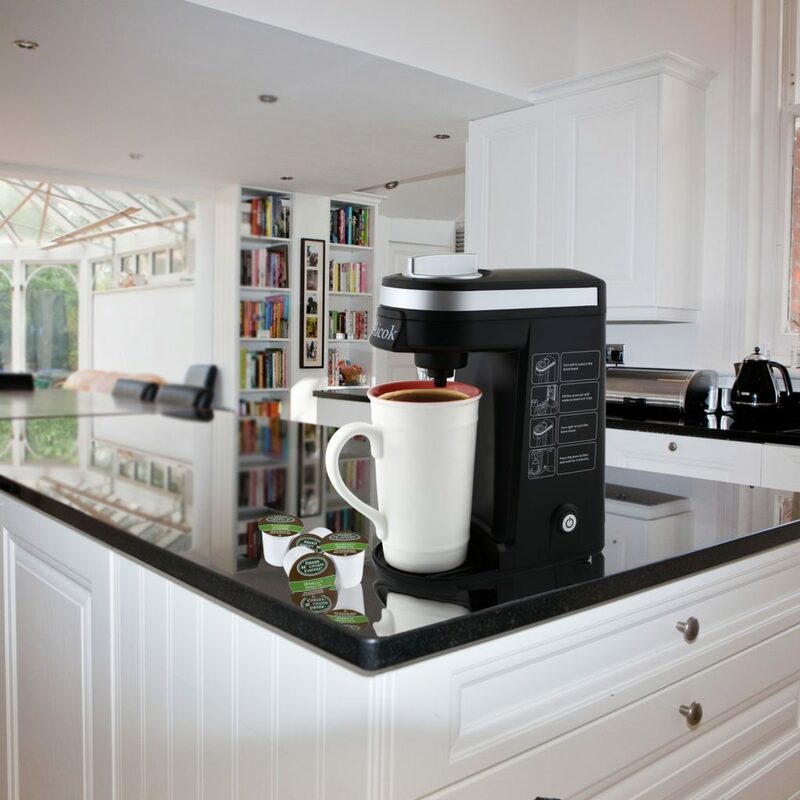 This coffee maker is designed such that it can accommodate even large sized coffee mugs. It has a compact design and will brew your coffee in just three minutes. Quick brew technology that helps you brew in only 3 minutes. One touch button that indicates when the machine is in use. Auto shut function that allows the machine to go off when brewing is complete. Removable drip tray and 12 oz. water reservoir. With auto shut function, it is good for saving power. Aicok k-cup coffeemaker is good for travel since it is a lightweight. With its small size, you can use it in office, dorms, and apartments whenever you are traveling. One touch button control allows ease to use. With 12 oz. water tank, you can brew several cups of coffee before refilling. The Aicok single serve can accommodate standards sized coffee cups and mugs of 5 ½ inches long. With the removable drip tray, it is easy to maintain clean. It also features a brew lid with lock and unlock features which prevent overflowing. Additionally, the water tank of this machine is made of BPA free material hence assuring you safety. 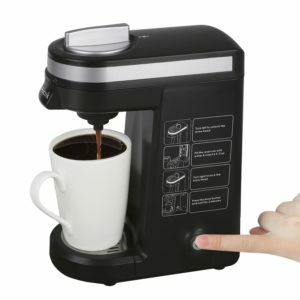 This K-cup coffee maker is our favorite to buy for a very low price and more than solid quality. This machine applies a technology that enables it always to brew smooth and sizzling hot coffee. Like all iCoffee single serve machines, this coffee maker is compatible with all K-Cup, RealCup capsule, OneCup, and any other private label cups. This compatibility increases the versatility of this coffee makers. This decent and stylish coffee maker will fit perfectly on your kitchen counter as it measures 14 x8 x11 inches and weighs 8.27 lbs. Spin brew technology that enables the machine to turn, steam and stir inside the cup. Pour and brew technology which allows pouring the amount of water you want depending on the coffee strength. 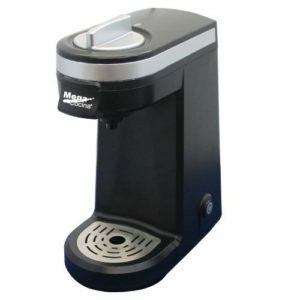 Icoffee steam brew coffee maker has a removable tray allowing the use of any cup size. Safety locks which activate during brewing. BPA free unit with a removable tray. Easy to clean considering the removable tray. Stylish with a compact design that perfectly fits in your office or home kitchen. The opening to add water is rather small. It has no auto shut function. It requires daily water addition. 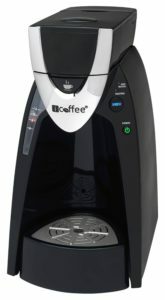 The Icoffee K cup coffee maker is good for use in homes and offices. Regardless of these cons, the single express steam brew coffee machine is reliable and really cheap. The features and benefits it offers make this coffee maker worth its price. It has a silicone plunger with a removable lid which provides K-Cups storage. BPA free water tank that is magnetically connected at the base of the coffee maker. It has a non-skidded rubber surface which prevents the mugs from falling when you are refilling. It can hold medium-sized coffee mugs. Measures 6 x 6 x 14.5 inches inches and weighs only 1.8 pounds. Most of its parts are easy to dismantle hence best if you are short of space. Easy to clean and is dishwasher safe. Easy to assemble and takes seconds to brew a cup of coffee. Gourmia portable coffee maker is made of solid durable material. Small size and lightweight hence good for use when traveling or camping. 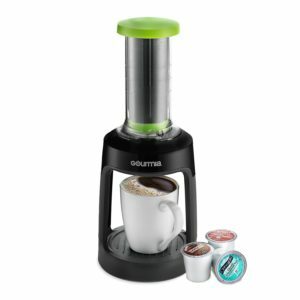 Gourmia K-cup coffee maker is manual hence no need for electricity for you to enjoy your cup of coffee. Easy to use as all you require is to select the K-cup of your choice, fill the water tank with hot water and slowly press the plunger down and voila, the brewing is complete. We highly recommend all travelers, campers, hikers and those who want to at any time to enjoy their coffee to buy this great small and cheap coffee maker that can use K-Cups. This low-priced portable coffee maker is different from all the others because it does need 2AAA batteries in order to make your favorite morning drink. It doesn’ use ground coffee, it is created to use only K-cup capsules. The good thing is that you can enjoy in different K-cups flavors wherever you are. 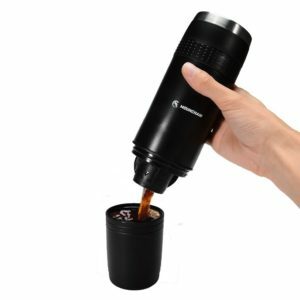 Every portable coffee maker or espresso maker is meant for outdoor use, so their dimensions should be suitable for bags and cars, with only 3.1 x 3.1 x 10.2 inches dimensions, this one is no different from others. All you need for good outdoor coffee is K-cup capsule and hot water. People often think that this coffee maker can heat water because of the batteries but their purpose is only to make water run through the capsule, if you use cold water you will get cold coffee. Water reservoir capacity is 12,66 oz and it is perfect for Americanos. If you are not that much in love with espresso, and you like to drink your coffee in larger amounts this little maker will fulfill your desires wherever you are. 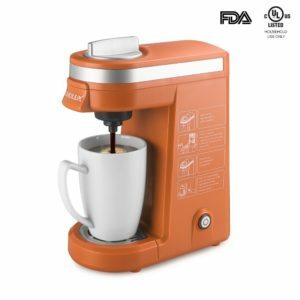 With FDA approval and the fact that it is made of food grade plastic, K-cup portable coffee maker will carry out your need to drink your coffee from healthy and environment-friendly appliances. Its large water reservoir and the fact that it uses K-cup capsules makes it possible for you to even make hot chocolate. What more could you possibly want? CHULUX coffee maker ensures the freshness of your beverage by producing one cup at a time. It managed to appear in our list considering its efficiency, reliability and more so affordability. Although it is designed for original k-cups, it can accommodate other capsules. You can buy this cheap K cup coffee maker in very interesting colors. Work with all K-Cup capsules. Measures 4.3 x 7.4 x 9.8 inches and weighs 2.2 lbs. Features a removable drip tray which allows you to use a coffee mug of your choice. Easy to clean since all removable parts are dishwasher safe. Has water reservoir that holds a capacity of 15oz. It has a smart and simple button that indicates when the brewing is in progress. Water reservoir made of BPA free material. It uses NTC stainless steel heating material instead of a heating tube. Straightforward and fast to use and takes only three minutes to brew a cup of coffee. Auto shut when brewing is complete ensure energy preservation. Brewing lid with a lock and unlock button prevents spillage while brewing. Small in size and a lightweight hence adequate for travel. This small size K-cup brewer is good and cheaper alternative to expensive Keurig coffee makers. Mega Cocina machine makes one cup at a time and accepts different K-cup capsules which give you choice when it comes to flavors. It takes a few minutes to brew your favorite cup of coffee, tea, or chocolate. With a removable drip tray, you can easily fill your travel mug. 12 ounces BPA free water tank. It has multidirectional brewing systems. It is compatible with all K-cup capsules. It is highly convenient and especially when traveling. Heats up fast and hence provides with a hot cup of coffee within minutes. It has no visual for water levels hence requiring you use a cup every time you are refilling. If you consider the features offered by each one of the above k-cup coffee makers, then you will realize that their price is quite an offer. Most of these coffee makers are suitable for people who travel a lot either for business or pleasure purposes. With their compact small sizes, you can save yourself a few dollars every time you are out of the home. Although Keurig is definitely the most famous single serve coffee maker this these cheap k cup compatible brewers also have a great advantage over Keurig 2.0 machines and it is an advantage that they will always work without problems with non-Keurig K cups. Should You Freeze Ground Coffee?